Join us for our 2nd annual golf tournament, benefitting the Boys & Girls Clubs of Lanier - Forsyth County Chapter. 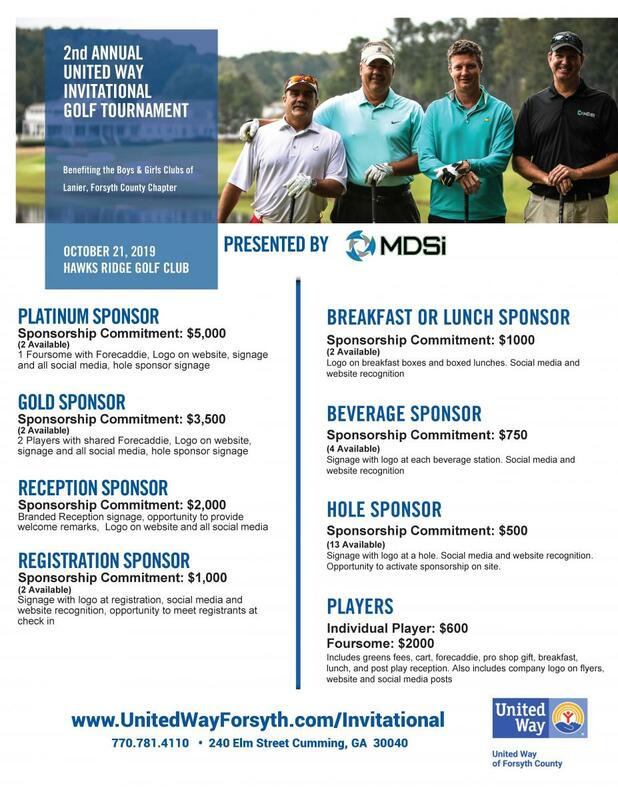 United Way of Forsyth County would like to invite you to be a player and/or sponsor for our 2018 Invitational Golf Tournament. We are working to help improve the lives of individuals and families right here in our community through our focus on the basic building blocks for a good life: Education, Financial Stability, Health and Basic Needs. As a member of our community, we know that individuals and companies like yours want to make a difference. Sponsorships not only provide valuable advertising for local businesses, but they also help to position your business as a compassionate community leader and builder. By becoming a sponsor today, you're allowing us to host community events without touching one cent of our donors' dollars. Instead, we are able to invest these funds into programs that help residents of Forsyth County. Want to play? click here for more information and the registration form. Join others in making an impact through a United Way corporate sponsorship. Click here to view the 2019 Invitational Golf Sponsor information. Want to join us as a player? Huge thank you to MDSi for stepping up as our Title Sponsor! To find out how you can partner with United Way in 2019 contact us at 770.781.4110. Live United by becoming a United Way of Forsyth County Corporate Sponsor today.